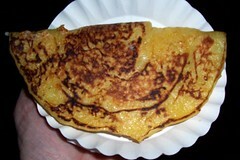 Narrow and plump, or wide, flat, and folded, you can't go wrong. 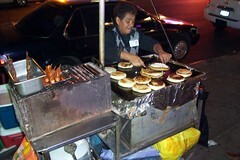 Maria Piedad Cano, the "sainted Arepa Lady," prepares two versions of Colombian corn patties ($3 each) at her Roosevelt Ave. street cart, now larger and shinier than the one seen here. 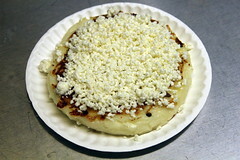 The batter for the pancake-like arepa de choclo (first photo below) is made from freshly ground corn, folded over grated cheese, and is sweeter overall; on my first visit, after dinner nearby, I thought of it as dessert. 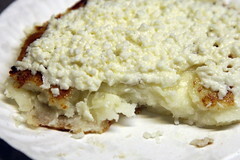 The puck-shaped arepa de queso is made from corn flour and stuffed with cheese that manages to give without descending into goo; it's a bit saltier. The names are somewhat arbitrary ("choclo" means corn, and "queso," cheese), and they're not referenced on the cart itself, but if you have the slightest doubt about which is which, or which to order, why not get one of each?